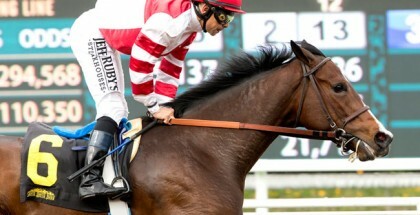 Songbird Flies Into Santa Ysabel: Still on course for the Kentucky Oaks (GI) in May, Fox Hill Farm’s Songbird drilled in 48 seconds flat on Sunday under regular rider Mike Smith in preparation for the Santa Ysabel Stakes (GIII) on Saturday at Santa Anita Park. While anticipation remains high, debate continues on whether this is the right path for such a special filly, or whether she should start facing colts. Still on course for the Kentucky Oaks (GI) in May, Fox Hill Farm’s Songbird drilled in 48 seconds flat on Sunday under regular rider Mike Smith in preparation for the Santa Ysabel Stakes (GIII) on Saturday at Santa Anita Park. The connections remain adamant in their belief Songbird will stay in filly races for now. Hollendorfer, right or wrong, has always been more conservative with his female stars. Songbird holds an undefeated 5 for 5 record. 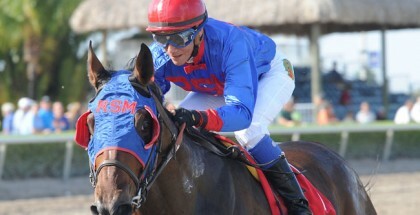 When racing fans see the word “undefeated” around a stakes runner, a special aura surrounds that kind of horse. Songbird gives the impression of a filly that might be talked about long after her career ends. 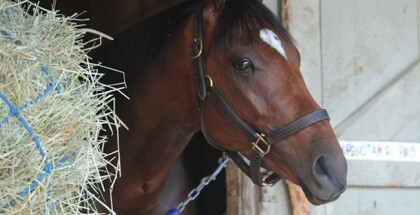 Her record thus far supports the theory she belongs competing against colts and aiming towards the Kentucky Derby. 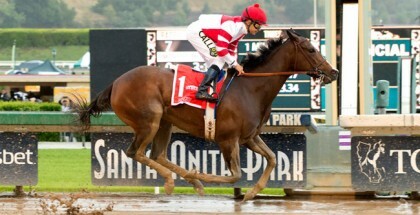 After winning at Del Mar easily for her career debut by over six lengths, Songbird immediately entered graded stakes company in the Del Mar Debutante (GI) and coasted home by over five lengths after outdueling the Bob Baffert-trained Pretty N Cool. Then, Songbird entered the Chandelier Stakes (GI) at Santa Anita and won by just under five lengths. Between the second-place finisher Land Over Sea and the third-place Right There, there were nine lengths separating them. Going down the chart a bit further, at least 10 lengths separated fifth-place finisher Jade Princess and Halo Darlin in sixth place. In dirt racing, when the field thins out towards the end, it usually (not always) signals a fast race. Continuing her dominance, Songbird won the Breeders’ Cup Juvenile Fillies (GI) in late October against the previously undefeated Rachel’s Valentina, daughter of the legendary Rachel Alexandra. After a well-deserved break, Songbird returned strong last month with another easy victory in the Las Virgenes Stakes (GII). If Hollendorfer and Rick Porter (owner of Fox Hill Farm) wanted to attempt racing against colts, no reasonable person would argue against the idea at this point. She has few peers in the filly division except for Cathryn Sophia. Even then, there is no reason she cannot take on males now and Cathryn Sophia later on, and run a mixed campaign of sorts. Regardless, she is ready to fire a big race in the Santa Ysabel. Smith praised her recent workout. “That was probably one of the best half miles I’ve ever gone, about as easy and as smooth as you could possibly go; very impressive,” he said. Oh wait, there are other fillies in the Santa Ysabel to discuss. Well, Songbird meets her constant opponent Land Over Sea once more. Plus, Street Fancy takes another shot. Baffert fans might take some interest in Jade Princess. These are young horses and they can improve dramatically without warning. Just single Songbird though in whatever multi-race wagers and move on. While vertical wagers are not recommended in this situation, putting a massive longshot underneath Songbird is necessary to make the bet worthwhile. Is Shagaf the Real Deal in Gotham at Aqueduct?